Have you heard all the hype about content marketing? The new 'thing'? Do you have content marketing babble fatigue yet? Like, seriously. How many experts can simultaneously shout from roof-tops (virtually of course since rooftop shouting is so passe' - just like billboards and newspaper ads - now it's all about blog posts!) about the amazing new marketing method - #CONTENTMARKETING!!!!! Not only is the frenzy resulting in volumes of asinine content like press releases announcing klout scores, but it also fundamentally misses the point. Content marketing isn't new. This great infographic that @JoePulizzi recently included in one of his posts shows that the practice is at least a century old, if not 4 millennium. Then what's the hype? Fair question. And the answer isn't content, it's ubiquity of high speed internet access and quality of search engine results. As I outlined in my recent book "The Current State of B2B Sales & Marketing: Why owners & "C" level execs should be pumped and VPs of Sales & Marketing should be terrified" the simple fact that now 93% of all B2B buying processes originate online, defines B2B marketing today. As companies slowly awaken to the fact that static "brochure" type websites don't help them get found, and no longer substantiate credibility but actually compromise it, there is increasing energy devoted to creating dynamic sites rich in fresh, quality content. Information of legitimate value to buyers doing research not only improves the chance of being found in a search, but substantially improves the connection that is quickly forged with a potential buyer. Add integrated disciplines of a comprehensive inbound marketing program, including lead nurturing, and suddenly content marketing has a new face. And much more immediacy in addition to a broader reach. So if you have a hang-up about chasing the latest fad, you may be inclined to wait before investing your marketing dollars in content marketing. But in the context of history, it's actually a proven approach. And there can be little debate that the internet's effect on buying behavior and B2B marketing is profound and irreversible. That means stratgy and planning, which in turn means folks that understand B2B marketing - not the recent intern who happens to navigate Facebook and Twitter with aplomb. But the best place to start is to understand what's happening around you. 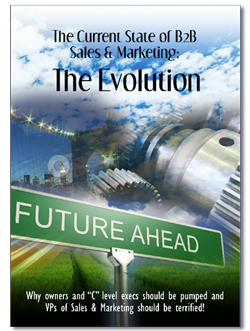 And the most efficient way to do that is to download and read this free book on B2B Sales & Marketing.